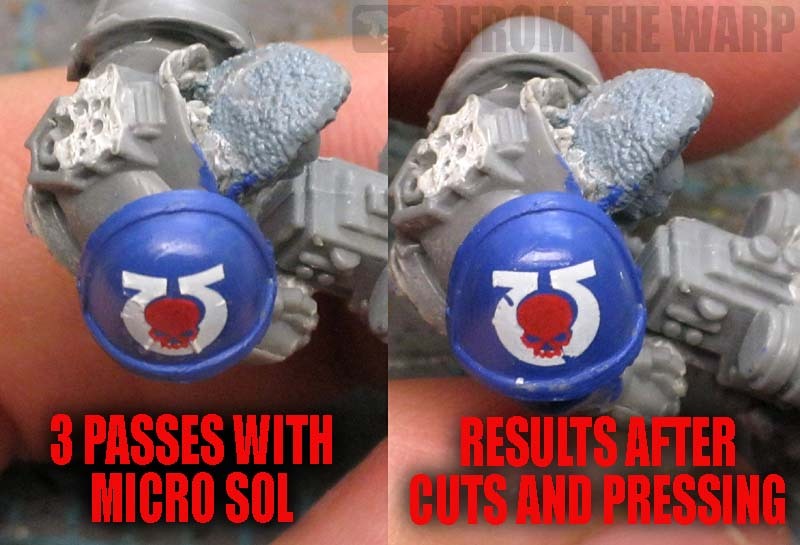 You can use Micro Set and Micro Sol or you can skip them when it comes to applying waterslide transfers (decals). This post will look at both ways. 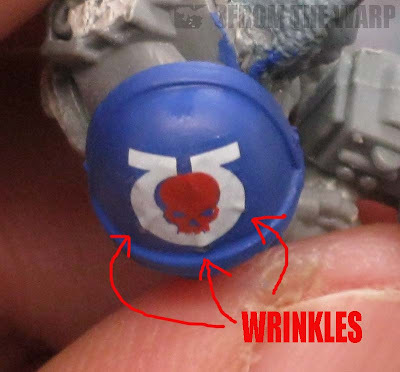 With Games Workshop releasing a handful of new transfers for a couple more chapters, I finally decided to share how I go about adding decals to my models. 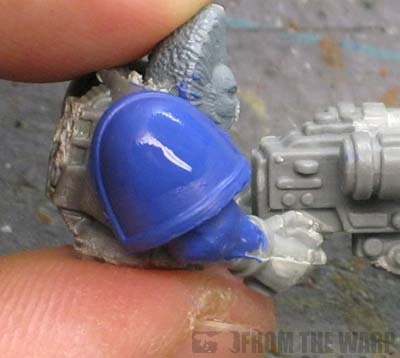 This post will look at how I apply the standard GW decal to a model without using Micro Set/Sol and then trying to use them for the first time. Games Workshop gives us their approach and there's nothing wrong with it. In fact, it may be a bit better than what I'm doing here, but I haven't found a need to do it exactly as they suggest. Just like everything else in this hobby, there are a hundred ways to do something. I'm going to look at two methods to get your decals applied in the post. The first one is with water alone and nothing fancy at all. The second method uses Micro Sol and Micro Set to get the decal applied. As far as tools, you're going to need a few things to get the best results. Water. You'll need a small, clean cup of water. I like lukewarm temperature. Some folks say cold, but I use room temperature or ever so slightly warmer. Obviously your model will need to be painted. I paint up to the point of having all my highlighting and shading done, but no battle damage or anything else (powders) just yet. Once I'm at this stage, I'll add my decals and then add all the damage and weathering on top of it so the decal blends in with the rest of the model. When it comes to cutting out your decal, cut as close as you can to the outer edge of the image. Follow the outside shape as best as you can. I leave about 1 millimeter around the image myself. It does you no good to do this with anything other than a brand new blade. You want the cleanest, sharpest edge you can get. Once you have it cut out, you can either pick it up carefully by a corner or edge with your tweezers or stick the very tip of your X-Acto blade through a spot along the outside edge where you have a sliver of free space. Sometimes your decal will fall off your blade, but it's not that hard to fish it out of your water if it does. I let my decal soak for about 30 seconds. Once my decal has soaked long enough, I take my paintbrush and apply a bit of water to the surface of my model where I'm going to set my decal. I don't want a huge puddle on there, but enough that I can move my decal around with relative ease. Since I'm holding the decal with one hand, I take my paintbrush in my other and gently push (slide) the decal off the paper and onto the model. 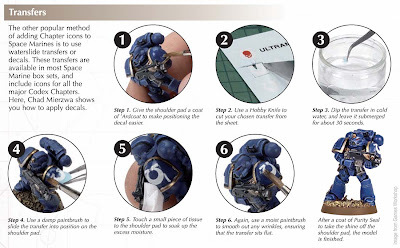 If you get a fold or even a small tear, don't worry, you have a few minutes to get the decal sorted. Worse case scenario, you can always start over with a new decal. If your water starts to dry up or it's hard to move the decal around, adding a tiny bit of water will help the decal float on the surface until you get it positioned correctly. Wrinkles come from trying to apply a flat decal to a curved surface (like a shoulderpad) and since the decal only has so much give and take, you end up with small wrinkles as the decal attempts to conform to the surface underneath. 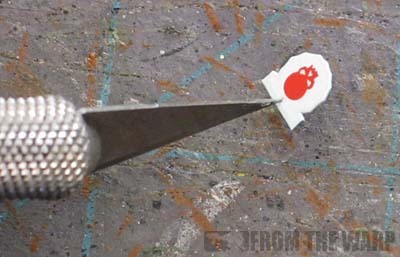 The way to get rid of them is to make very tiny relief cuts. You don't need to press very hard at all, all you're trying to do it cut the decal and let it fall in place over the curved surface. Once you have it where you want it, a small piece of tissue paper or even a dry paintbrush can be used to wick up any remaining water from the surface. Be careful though, you don't want to move or damage the decal during this part, you just want to remove the excess water. NOTE: Some folks prep the surface they will be applying their decal to by giving it a quick coat of gloss varnish or 'Ard Coat. I don't usually do that and I've never had any issues yet. It can't hurt though I suppose. You may want to seal the decal in place at this point to prevent it from getting damaged once you start adding battle damage and such. A quick coat of varnish over the decal and you should be all set. Again, I don't always do this and as long as your careful working on and around the decal, you should be fine. I haven't had any issues yet. Now you can add all of the environmental effects you want over your decal. Just remember to be careful when working around it so you don't destroy it. Especially if you haven't sealed it in place yet. But what about using Micro Sol and Micro Set? 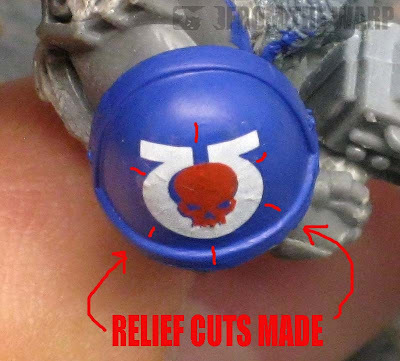 Yes, the second part of this tutorial and how to avoid having to cut relief cuts into your decals. In theory that is. You'll need both the Micro Set and Micro Sol. I picked mine up from my FLGS (Game Vault) for just under $6. Supposedly a single bottle lasts you forever too. I gave this guy the benefit of the doubt and gave his shoulderpad a quick pass with gloss varnish in order to make the surface as smooth as possible. Probably not necessary, but I wanted to see this stuff really work. The process is the same as before. Cut your decal out and soak it in water. The first difference is you apply Micro Set to the surface of your model instead of water to help position it. Add more as needed to get the decal where you want it. Once you have your decal in place, wait a few minutes for the decal to soften and then wick away the excess Micro Set. NOTE: I did not wait as long as I should have during the MicroSet stage. I went right from MicroSet to MicroSol and didn't give the MicroSet time to soften the decal as much as it could have. I learned this when I did the process a second time after making my own decals and gave the MicroSet about three minutes to do its job (this will be a future post!). Then it's Micro Sol time. Apply this stuff to your decal while being careful not to move it around. At first it won't appear to do anything, then your decal will get super wrinkly and then slowly the wrinkles will disappear at the Micro Sol dries. One application of Micro Sol should do the trick and get your decal to conform. You may need to repeat the Micro Sol step if all the wrinkles don't come out the first time. I ended up making three passes with the Micro Sol letting each one dry first. I also cut some tiny relief cuts and ended up using my fingertip to press the decal down into place. The end result is that I slightly damaged the decal, but you can tell the Micro Set/Sol process gets a much more conforming look in the end compared to water alone. I think with some fine tuning on my part, I should be able to get spot on results. And that's what I need because the next step is making my own decals to add to my Novamarines. It's easier than you think and knowing how to apply them to get the best results should really up my game. 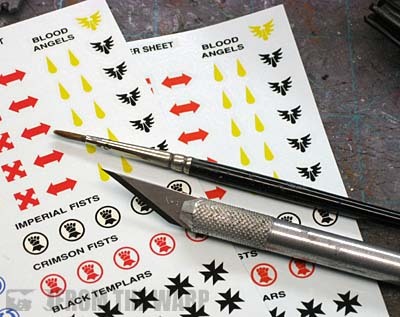 It's been years since I've had any fancy tools for decals, but I really, sorely miss Solvaset - it's basically Micro Sol and Micro Set in one go. Find out if it's still available and give that a go, Ron - it made it so even a kid and then teenaged me could do decals. Perfect timing for this article. I'm just about to try applying decals to my Space Wolves for the first time. I have two Vallejo products that I assume are their equivalents to Micro Set and Micro Sol. To be honest I have never used decals, my main issue is not appling them, but how long they will last! I have seen a number of decals on other peoples armies that have cracked or rubbed away. Not sure if it's how they were applied or if it's a normal thing for that to happen though? Faolan (Jake): Never heard of that> I picked up the MicroSet/Sol from my FLGS and they had dust on them. Not many people seem to use the stuff... at least 40k players. Apparently the Flames of War guys use the stuff all the time for decals on their tanks and such. Paul D.: Not sure. Give them a go. I can tell you that after a few ties, the MicroSet/Sol stuff is great and works perfectly for me. IDICBeer: I gave my finished decal a few coats of matte varnish and you can't even tell it's a decal anymore. The gloss is gone, the edge of the decal can't be seen and it looks "painted on" as they say. Honestly, I wouldn't let that keep you away from using them. Piotr Michalek: Relief cuts will work. Following the MicroSet/Sol directions to the letter will get you better results. With my later decal attempts, they came out perfect without having to do any relief cuts. Patience is the key. Great Post. I had to learn how to do the relief cuts on my own with my 13th Co decals on shoulderpads. I use microsol now but haven't bothered with microset. With small relief cuts in the clear portions of the decals and the microsol, I get great results. 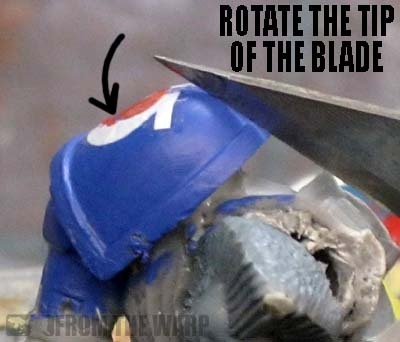 -One tip I use to hide the edge of the decal, is once the decal is set in place and starting to dry, I take a brush with a bit of the base color under the decal and let it be drawn in and flow under the decal. This helps cement the clear edge down and hides it well. -As for durabilty, I went with a clear varnish spray over the whole model and have had no issues, to include gathering up casuaties by the handfulls at times. I'm sure a quick coat off "dullcoat" over the glossy varnish would tone it down for those who don't like shiny minis. I can't speak on GW transfers, but since I have gone to gaming with historicals, I agree with Ron, after I spray them with a matte clear coat on the shields, you cannot see the edges and the hold up very well. I have been using Microsol and Microset for a few years now and have had great results with it. For me the secret is to put down a coat of gloss varnish on the area before putting the decal down. This keeps you from getting a 'ring' around the decal from the clear decal paper. I also go over the area again with a gloss varnish once the decal is applied and dried - once you dullcote the model this will make the decal look painted on. Seems that the GW guide it more of a "In a perfect world...." idea. Thanks Ron for giving the good and bad side of things! Its always a good idea to see what others are doing. 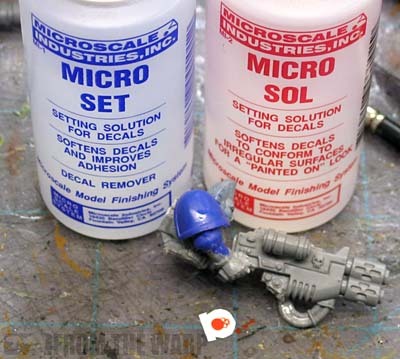 Micro Sol and Micro Set are amazing and get amazing "painted on" effects.... with other military kit tranfers but GW transfers are thicker and MSol and MSet dont do much with them. its a shame really. i have just gone back to using a gloss over to hide the tranfer then matt varnish to take the shine off. Another way i do it on character models is to apply the transfer onto the base coat only and the paint the shoulder pad using the tranfer as a guide. works really well and no gloss needed. Looking forward to reading about making your own transfers - keep up the great work! Spyrle: Thanks! Using the MicroSet helps soften the decal as well. The trick is to give it a few minutes to work as well. When it comes to durability, I don't varnish my models so I've taken to giving the particular shoulderpad a thin coat of matte varnish (brush on) before moving onto weathering. Danick: Never thought of using a Q-Tip to press it down. I'm going to have to steal that trick for sure. Clif Ganyard: Next Monday. It's easier than you think. PsychosisPC: I didn't think the matte varnish would do that well at hiding the edges of the decal once it was in place, but it works perfectly. I imagine with a bit of weathering on top of that, you'd never be able to tell. Big D: I think that gloss layer before applying the decal helps more than most folks know. It goes a long way towards smoothing out the surface underneath. Fayte: My pleasure. Hopefully it removes some of the unknowns for folks when it comes to applying decals and gives them that nudge to try it on their models. Gav Conway: Now that's interesting... painting over the decal using it as a guide. I can see that making for a nice effect although it might be tough on the smaller, more finely detailed images. Mordian7th and Tommy Clark: Thanks guys! Yeah its tough with small details but im working on a charadon army at the moment, i bought the charadon decal sheet from forge world and there are some VERY small tribal decals on there. but the charadon symbol is actually quite tricky to freehand an get it looking right so the decal "guide" works well. I have used MicroSet and MicroSol for years now and I'm very pleased with the results. When used properly, the decals do indeed look painted on. You can't see any wrinkles or edge silvering on my work. It bears repeating that best results come from applying the decal over a glossy surface - take the time to paint some gloss varnish over the area in question, it's worth it! Once the decal is set, apply a few coats of MicroSol to soften it sufficiently. Time and patience are of the essence here. I think that those who have been disappointed with these products simply need to try using them differently. the "official" GW way will never give results like this! Hi Ron, another excellent post! Glad I'm not the only one who had difficulty using decals. I've never used any micro sol/set before but I do use Humbrol Decal Fix, I find it excellent. Use it l as you would water basically but it dries as if you had put matt varnish on. Excellent! Thanks Ron. I have been having huge issues with decals and shoulder pads. Will give your technique a try. Thanks! Micro sol can get a decal in spots that you would think impossible. I painted a Pershing and the star went right over the gascap. It took a few passes but it did work great..
Once i set the decal, i blot it down with some paper towel. And I always seal the decal with varnish. Gav Conway: I can imagine some of the designs on their armour being done with decals much better than trying to freehand it. HeadHunter67: Yes, patience is the key with this for sure. ieuan: Excellent tip. That's the key to all this... finding a method that works best for you. Scullmeister: Excellent, hope it helps you out! Will Wright: I haven't added any decals to crazy places yet, but I suspect I'll cross that bridge one day. Cant wait for the post on making your own decals. I need some with Lions heads on, and cant find any for love nor money! Atreides: Monday the "how to make" post will go up. Lion heads huh? I would have thought those would be out there somewhere.